The autumn sun felt warm on my face. I was six years old and out to dinner with my family. My cousin, who was just months older than me, came with us. 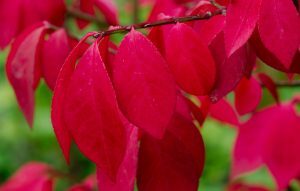 When we arrived at the restaurant, I saw a beautiful bush with bright red leaves. I had never seen anything so beautiful in my life. I wondered how the leaves could be so red. I thought for sure this was a rare and special plant. So rare and special that I wanted to take a leaf home with me. I reached in and gently selected what appeared to me to be the reddest, most beautiful leaf in the bush. I wrapped it in a tissue and stuck it in my pocket. Throughout the whole meal I was filled with this sense of wonder and excitement. I could hardly pay attention to what I was eating or what people were saying because I knew that I had found such an amazing treasure. On the ride home, I wondered what I would do with this beautiful leaf. I considered telling my cousin about it, but I wasn't ready to share. Then suddenly, I realized the perfect thing to do with it. I decided that I’d give it to my cousin as a gift. When we arrived home, I hurried up to my room and found a small box that fit the leaf perfectly. I wrapped it with colored construction paper, finishing it just as my cousin came into my room. Oh, my heart was full of joy. I knew she’d be so excited when she saw how beautiful it was. She eagerly opened the paper and ripped the lid off the box. Her face showed confusion as she starred at the tissue that was tucked inside. It felt like hours went by as she stood there, frozen in time. Then she pushed back the tissue and the look of confusion turned to disgust. Angrily, she threw the box and the leaf to the floor and stomped out of the room. As she left she was threatening to tell my parents how I was being mean to her. My heart shattered. I couldn’t believe that she didn’t see the beauty and wonder I saw in that leaf. In that moment, I decided that there must be something wrong with me. I was embarrassed and filled with shame. Later, I would tell her that I was sorry, that it had been an unkind joke. How could I have been so stupid to think that a dumb old leaf was a special gift? I was so grateful she hadn’t told my parents. I’m was sure I would have felt even more humiliated and ridiculed if she had. This was a time in my young life where a seed was planted that created a whole story and belief system for me. From this experience, I came to believe that I was too sensitive, that I was not “normal” and my sense of wonder was an impediment, and a dangerous one at that. It was not safe. It drew ridicule and later in life, I found that it made me appear weak. The interesting thing about the way these seeds begin to germinate is that once a belief is planted, other experiences often reinforce the belief. The more often this happens, the deeper the roots take hold. Belief systems are deeply embedded in our psyche and are often the very thoughts that inform our decisions throughout our lives. Many times, these belief systems are flawed; created out of situations that were misinterpreted by our young minds. Can you imagine what would have happened if my cousin had seen the red leaf with the same sense of wonder as me? It likely may have changed the whole course of my life. I look back now and see where I put that sense of wonder away, closed my heart to the longings that tugged at me and pretended that I didn’t care about such whimsical things. When I started doing my own soul excavation work many years ago, these belief patterns were the starting point to dig deeply, beneath the rubbish that had been piled on by me and others, and the basis to uncover my authentic self. What surprised me in this process was the fact that I did not even realize that this belief was at play in my life. And, as I became aware of it, I began to backtrack through many stories and examples that helped me to see how much of an impact this belief truly had in my decision-making processes. The pattern affected the relationships that I chose (no one with too much sense of wonder), the jobs that I selected (nothing too creative) and how I interacted with people who displayed this characteristic. Yet, in the end, these decisions were in direct contradiction to the “real” me. As my misinformed stories began to unravel, it felt very vulnerable and scary, but also incredibly empowering and rewarding to shift and align with my authentic self. Each step has been life changing and I’m grateful for the process. I’m also incredibly grateful that I can share this work, coupled with my intuitive gifts, with my coaching clients. It fills me with wonder and awe every time I witness these pattern shifts in others. It serves as a reminder for me and reinforces the shifts I’ve made on my journey so far. I now celebrate my whimsical, child-like sense of wonder. Nothing brings me greater joy than to experience the sight of a budding flower, a cotton-ball cloud or to hear the small peep of a baby bird, just to name a few. And don’t be surprised if one day I hand you a small box containing a beautiful red leaf.